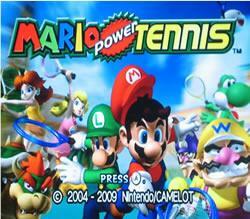 Mario Power Tennis originally came out on the Game Cube and was later released for the Wii. Of course the Wii/Gamecube were backwards compatible anyway, but the re-released version for Wii took advantage of the new style wireless play controller (and undoubtedly the tennis racket add on for that controller) and added a new dimension to gameplay. As ever with the Mario Tennis series the player can choose from a wide range of popular characters from the Super Mario Bros series to play as including Mario, Princess, Yoshi, Bowser Jr. and many more. Additionally to this once you battle you're way through the singles tournaments, matches and doubles tournaments and matches you will unlock a whole host of new characters as well as other features like mini games and even more extravagant courts as well as the ultimate Mario Tennis challenge - the star tournament. In the Wii re-released version; you can perform different strokes by flicking the Wii remote in the direction you want to strike from. The new motion sensitive controls mean the player can actually move like they are in a tennis match, rather than simply being seated with a gamepad. The controls for this game came in different sensitivities etc and the controls themselves even had difficult settings - the more difficult being the more real-to-tennis controls. Levels ranged from easy, medium, technical and difficult. There is a court where players can cast aside their racquets and replace them with less elegant weapons such as massive mallets; but the chaos doesn't end there; players also need to avoid the crocs and other enemies which are running around and trying to return their opponents serve - this is what allows us to differentiate between "Tennis" and "Mario Power Tennis" Yeaaah!